Review: "Mike Antonelli and Friends: Live Sessions" - Sea of Tranquility - The Web Destination for Progressive Music! Live albums can sometimes be a tricky thing. In some cases, the performances recorded can represent an 'off' night by the band or artist, in others the playing can be spot on but somehow the songs wind up sounding not much different from their studio siblings. Often in the history of music, we've also seen live recordings released that were doctored up so much in post production that the question comes up, "Is this really still a live album?" Normally, with the genre known as jazz, the idea of playing live is often not just to perform compositions originally created in the studio, but to expand and breathe new live into them, the musicians playing off each other and taking these constructed arrangements & melodies and adding an element of adventure, commonly known as improvisation. 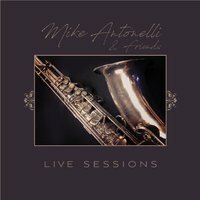 Case in point with this new live album from Mike Antonelli and Friends, titled Live Sessions, which culls together two performances, one from The Barn in Liberty, New York (August 20, 2016) and the other from The Brewery at Orange County Hops (Antonelli's establishment) in Walden, New York (August 10, 2018). With a range of musicians that included Antonelli (tenor sax), Jason Miller (trombone), Ryan Cerullo (keyboards), Peter Nobile (bass), Tom Venable (drums), Ricci Saracino (drums), Pito Castillo (congas), Wayne de Silva (alto sax), and the legendary Joe Lovano (soprano sax), the leader and his musical crew tackled an assortment of original songs that celebrate the bebop era and expand on it, giving a modern touch to this very classic jazz style. "Kiki" grooves and rumbles, "A Night in Phoenicia" soars with dueling explorations from Antonelli & de Silva, and Miller's thick trombone adds a sultry touch alongside the leader's smoky melodies on "Three Halves", the chitter chatter of the bar patrons in the background just adding to the lovely 'live' feel of the recording, Cerullo's majestic piano solo the icing on the cake. His cascading piano notes and Castillo's congas add a Latin feel to the upbeat "Tomorrow's News", while the can't miss tenor sax melody of "In a Minute" is a thing of beauty. Venable's deft cymbal strokes and Nobile's lush bass tones drive the classy "Hello Whitebeard", allowing for Antonelli and Miller to each deliver stunning solos, with tasty electric piano courtesy of Cerullo adding the color. "Mississippi Monkery" does exactly what it sets out to do, which is make you feel like you are sitting in a loud, smoky bar in the deep South, the band playing up a storm while the patrons are having themselves a good old time, the obvious crowd noise from Antonelli's brewery further adding that extra added piece of imagery to this recording. It's one of the more raucous pieces on this live set, and shows the band firing on all cylinders. "Alva's Moondance" (named after the leader's wife) is a more expansive affair, and features the appearance of Lovano, a real jazz heavyweight who has played with the likes of Paul Motian, John Scofield, Peter Erskine, John Abercrombie, Steve Swallow, McCoy Tyner, Chris Potter, Charlie Haden, and many more, in addition to a lengthy solo career. Here, he and Antonelli share the stage together and create some real magic with their weaving saxes, the band holding down the fort while the duo launch into musical journeys that will thrill any genre fan. Perhaps the leaders signature track, "Bossa Que Passa" follows, a rhythmic tour-de-force with never ending grooves and melody lines that are simply irresistible, Antonelli's tenor shooting to the stars and back, and both Saracino & Castillo adding those percussive, Latin flavors. Props here also to an engaging trombone solo courtesy of Miller, who takes the listener on a wonderful ride before giving way to Cerullo's gorgeous piano. The final cut is taken from the 2016 show at The Barn, the boisterous "Mic-Tic-Tic", which features some thunderous drumming from Venable and another appearance of de Silva strutting his stuff alongside Antonelli. Though Live Sessions is presented as a whole, you can definitely hear the differences in the recordings on both performances, and it was smart to blend the tracks together, as you get a varied feel from song to song. The Brewery tracks have plenty of crown noises alongside the performances, while at The Barn there's little to any of that, resulting in more of a 'live in the studio' sounding affair. Either way, the performances overall are exemplary, the musicians obviously having a great time and feeding off each others energy, taking these Antonelli compositions to new heights and showing that jazz can pack as much punch as any other musical genre. Now that's what a live album is all about!